I don't get this joke. Is it some kind of play on "water, too?" Two scientists walk into a bar. The first says, "I'll have some H2O." The second says, "I'll have a glass of water too. Why did you say H2O? It's the end of the day and there's no need to talk about work." The first scientist stares at his drink, angry that his assassination plan has failed. Scientist 1: I’d like some H₂O. 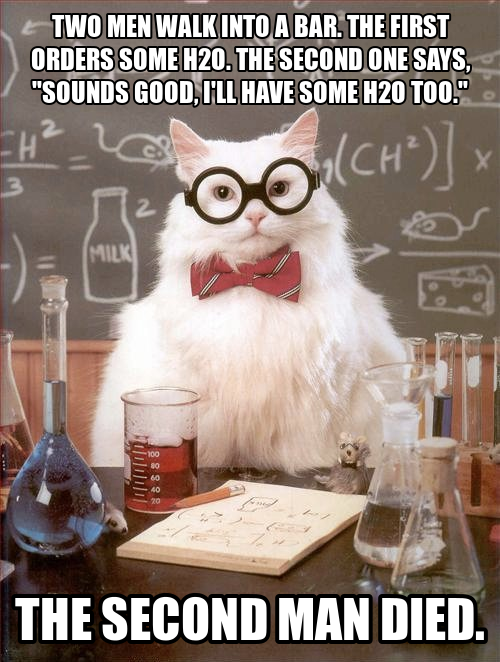 Scientist 2: I’d like some H₂O, too. Scientist 2: I’d like some H₂O₂. H₂O₂ is the chemical formula for hydrogen peroxide, of which a glass would be highly toxic. As choster explained, this is a modification of a chemistry joke. I'd just like to add that this is an example of an anti-joke. An anti-joke is typically prepared and delivered in a similar fashion to a regular joke but the climax (the punchline) is realistic, disappointing or depressing. This can still be funny because it can still shock the listener. A man walks into a bar. He is an alcoholic and is ruining his family. 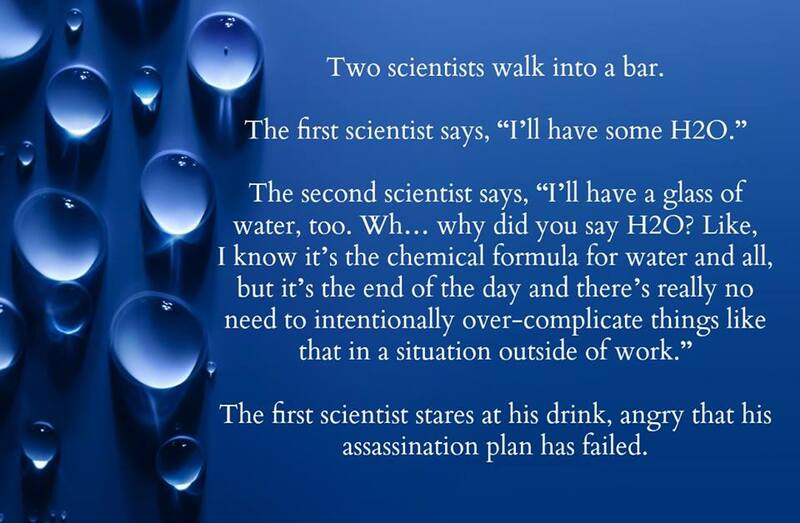 The punchline here is that H2O2 is hydrogen peroxide, which can be poisonous if drunk. Not the answer you're looking for? Browse other questions tagged puns or ask your own question. What is the first part of a joke called? What term refers to those who adhere to scientism? Is this correct: “I am to be dropped at the train station”? “I scream, you scream, we all scream for ice cream”- Is there a term that describes this 'word play'?